When this volume was first published in 1976, exchange theory had recently come into the fore in sociology as an attempt to develop systematic theories of social behaviour comparable to those which economics had developed. In doing so it borrowed from many different intellectual traditions including economics and anthropology, behavioural sociology and on the traditional concerns of sociologists and social psychologists. Dr Heath provides a systematic exposition of the principle components of exchange theory, and goes on to give a critique of these theories, paying particular attention to the success of their empirical applications. He concludes that exchange theory, despite its limitations, has an important part to play in the development of social science and is one of the most promising theories available. 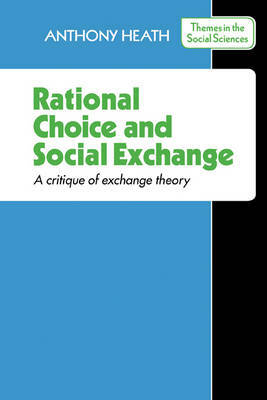 Rational Choice and Social Exchange will be of interest to anyone concerned with the development of social science and in particular to students of sociology, anthropology, psychology and political science.